Kids and their energies are too agile to handle. Parents are the pillars of strength and motivation for kids. If they cry, they look up to parents, if they laugh, they look up to parents. The quality time which you spend with your kids is going to shape their future. But, the way you invest and spend your time with them is going to make a mark in your kids’ life. Research also supports the fact that engaging time spent with your kid is very important for an overall development of the child. 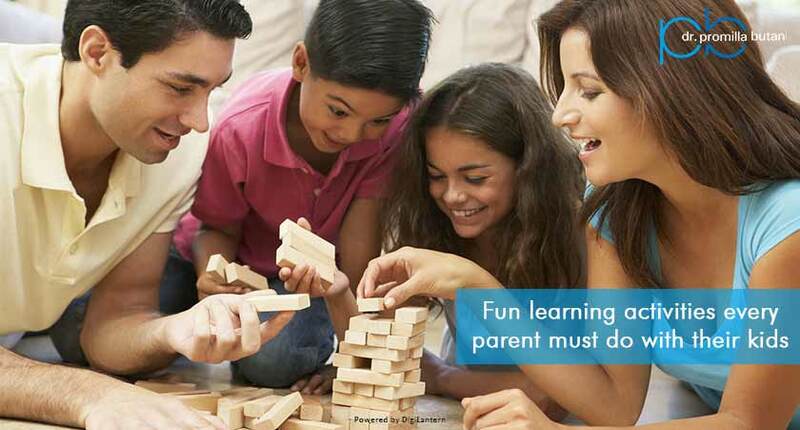 There are lots of things/fun activities which you can do with your kids. You need to ensure that you have fun with your kids so as to cultivate a friendly relationship rather than just being a preacher to them. Here are some interesting ideas to ensure that you spend some good quality time with your little ones. 1. Play outdoors – Playing outdoors is a complete nourishment for health as children will get fresh air (provided you are playing in an open and clean place) as well as physical activity. You can play football, cricket or any of your child’s favorite sport. The only idea is to connect with your child and let him know that you support them in whatever they are interested in while teaching them the skills of the game. 2. Read a book – Reading a book together will not only increase your bonding with the kid, but it would also inculcate reading habit in the child which is a lifelong possession. Let him read the storybook aloud and narrate the complete story. This would further increase his creativity as well. 3. Watch a movie together – And you thought it’s only your spouse or friend with whom you can watch a movie. No, but watching a movie together with your kid is an excellent idea to spend time together. You could scan for his area of interests and disinterests while watching the movie or it could simply be a fun time for you both. 4. Get creative together – You could start with making a greeting card, any paper toy or any other craft project. Generally, children love cutting and folding papers. Let them explore their creative world, you are only required to give the basic instructions, leave rest of the creativity to them. 5. Head for a nature walk – Nature is the best healer. It works as the best absorber as well as a reflector. If you are in good moods, happiness would reflect from nature. On the other hand, if you are sad, nature absorbs your sadness and creativity and you feel calm and cool. While walking the woods or even your backyard where some greens are there, would uplift your mood and walk with your little one would lend enough curiosity about nature and plantation. They would bomb you with questions, but that’s what would make them more creative and inclined towards nature. Dr. Promilla Butani is an undoubted name in pediatrics and child care. She firmly believes that parenting demands your precious time to be spent wisely with your children. She has been into child care since 1971 and has rich experience in counseling of parents as well. If you wish to seek more advice on parenting and rearing children, you must visit www.drpromillabutani.com. Previous Previous post: Safety is as simple as ABC – Always Be Careful!